The honor of wearing badass protective gear isn't limited to astronauts, supersonic jet pilots, or Tony Stark. Here's an apocalyptic collection of not-quite-everyday personal protective garments you should wear the next time you're taking on the Mandarin. 1942: Two people test American fire-proof suits lined with asbestos. This heat and gas resistant metal headpiece and suit was developed for mining rescue work in the Soviet Union in the Fifties. The headpiece has a built-in oxygen apparatus, cooler, and telephone. 1954: Workers of the Rocky Mountain Arsenal (Commerce City, Colorado) use airtight suits, gloves and masks to work with deadly nerve gas. They are not allowed to stay in the blending chamber for more than 20 minutes at a time, even in these suits. The Captive Man suit, a protective suit with an access tunnel attached for use in radioactive environments. It provided a barrier against radioactive contamination in the 60s. Soviet mine rescue team in protective suits in the 70s. Photo: Ukraine. Photoalbum. Publisher: Planet. Moscow, 1971. Soviet fire fighters practice mining fire rescue in protective suits. Firefighters practice rescue techniques and procedures for the aircraft fire simulator in Alpena, Mich., 1997. Here they drag a 110-pound dummy away from the flames in their heat-resistant clothes. 2002: Dressed in their SCAPE suits, workers are ready for the fueling of the Comet Nucleus Tour (CONTOUR) spacecraft in the Spacecraft Assembly and Encapsulation Facility 2 (SAEF-2), Kennedy Space Center. SCAPE refers to Self-Contained Atmospheric Protective Ensemble. A German soldier in a military chemical protection in the desert at Camp Doha, outside Kuwait City, Dec. 16, 2002. 2003: Damage Controlman 3rd Class Jeremiah Layman instructs his shipmates on the correct donning, wearing, and protective measures of an advanced chemical protective garment (ACPG) and gasmask aboard USS Nimitz (CVN 68). Fukuoka Prefectural Police personnel conduct chemical protection drill at a pier in Fukuoka, south of Tokyo, June 8, 2004. Singapore Civil Defense personnel in encapsuled hazmat protective suits gather outside a subway station during a simulated bombing training exercise, Jan. 8, 2006 in Singapore. "Redman" is a U.S.-made protective training suit used for hand-to-hand combat training. "Redman" allows "attackers" to strike its wearer without causing injury. Patrick Brown of ArcAttack performs at the Discovery Museum in Newcastle, England Friday, March. 11, 2011. Brown's chain mail suit acts as a "Faraday Cage" and protects the wearer from the electricity by causing it to flow around the surface of the suit and not through it. A sailor wears protective anti-flash clothing during an exercise in the Operations Room of the Royal Navy Type 45 destroyer HMS Daring. Anti-flash gear is basic personal protective equipment to provide protection to the head, neck, face and hands from short-duration flame exposure and heat. Lt. Ryan Ramsden runs in a protective suit while training with the Police Dog Operations Unit of the Australian Northern Territory during Talisman Sabre 2011. Bomb disposal officers are some of the bravest people on Earth. Here's what stands between them and a blast. Another pair of photos of an anti-explosives expert, this time a member of the Afghan National Army (ANA) Improvised Explosive Device (IED) Team of the Afghan National Army. 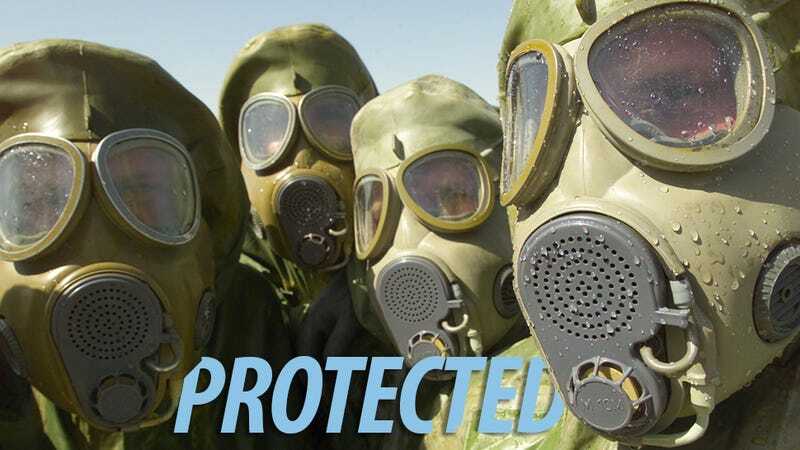 Marines and sailors conduct chemical, biological, radiological and nuclear defense training with the new M50 joint service general purpose gas mask. Camp Lejeune, N.C., Feb. 27, 2012.